In the Soviet Union the entire male population was obliged to undergo military service. For this reason every man in the country was familiar with special army "traditions" and standards of behavior. Many of these rules still apply to the civil service. It is inside the barracks that one of the most important phenomena of Russian corporate culture was born – the so-called smoking room. According to a famous pearl of army wisdom, "he who does not smoke – works". If an employee is absent from his workplace, this suggests that he is lazy or is taking some time off from his work, but if he is smoking, then he is busy. This pattern of behavior was brought back from the Soviet army, where cigarettes were included in the daily ration. In offices, this is an even higher priority if the boss also smokes. Today, following the adoption of a law that bans smoking in public places in Russia, the situation is gradually changing, but it is a long and drawn-out process, whereas the phenomenon of the smoking room has been around for a long time. The fact is that in Soviet enterprises, and even now in modern Russian offices, with very few exceptions to the rule, there are practically no recreational areas for employees. As for the employees, they needed a way to somehow relax, and the standard lunch at workplace canteens does not fulfill the needs of people. "Smoke breaks" were the perfect opportunity to get away from the workplace for a valid reason, to blow away the cobwebs, to just relax for five minutes several times a day. There was always a peculiar atmosphere in the smoking room. The smoking room makes all people equal, united in their one weakness. You can stand in silence for five minutes, and just smoke, or you can communicate with colleagues, discussing different topics, the latest gossip or simply various work issues. Men discuss female colleagues and politics. 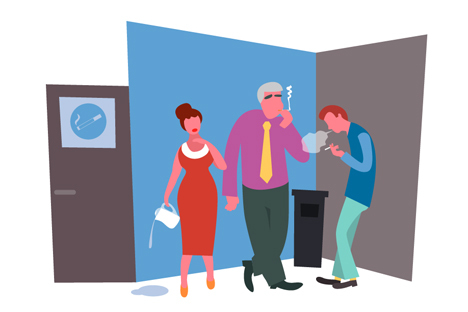 Working in a structure of a rigid hierarchy, the smoking room is a place where you have the opportunity to meet the normally inaccessible boss in an informal setting and to resolve your issues. "I remember how I once got a sudden promotion," says an employee of a major law firm. "So, we had been promised a long time before that someone from our department would soon get a promotion, and there were two candidates – me and one of my colleagues. We worked practically the same, neither he nor I particularly stood out, we were just busy doing our job. Women who work in factories where there are no places for recreation also needed their own area. The kitchen became this area. In offices without any kitchens it was just a place where there was a teapot. Women brought cookies to work, tea and arranged special "tea times" – unplanned breaks for approximately half an hour. Here, too, they talked about the most important issues, discussed the latest gossip, and the most experienced workers gave young employees tips for building a personal life. An accountant from a well-known business consulting firm recalls: "The senior colleagues at work, while drinking tea, constantly tried to match me up with somebody; they would tell me which men were kind and handsome, they would wonder why I was 23 years old and still all alone. I got extremely annoyed with them, but sometime later I still married a colleague." In the last 20 years, these Soviet-era traditions have gradually been transplanted into modern day offices – with one key difference. These days, men also participate in the aforementioned kitchen tea parties, and women go to the smoking rooms.